The wedding date has been set. But where should we marry and have a wonderful reception? Numerous hotels in Zermatt offer everything that is part of an unforgettable wedding day. Beautiful rooms, festive ballroom, dignified formal dining, floral decorations? All of this is not a problem in the Zermatt hotels. The team is always there with advice and assistance, has suggestions ready and implements everything according to the wishes of the wedding couple. "Riffelalp Resort 2222m" is situated at the heart of Gornergrat skiing/hiking area. The 65 rooms and 5 suites are fully equipped with modern 5* amenities. Restaurants: Alexandre - high cuisine; Walliserkeller - local specialities; Ristorante al Bosco - Italianita in Montagna; Pianobar. Pool and wellness center with Europes highest out door pool. Conference and banquet possibility. At the CERVO Mountain Boutique Resort, the design achieves the balance between an alpine chalet, lodge, hunting lodge and just the right dose of the modern. The CERVO is in winter time the only ski in I ski out hotel in the town of Zermatt - in summer time there is direct access to the walking trails by the hotel. Only 10 minutes walking distance to the town center. The restaurant CERVO Puro with sunny terrace serves Alpine cuisine with Northern Italian influence focussing on local and sustainably produced products. At the restaurant Ferdinand you may enjoy Fondue, Raclette and table BBQ in a trendy atmosphere. The CERVO Bar I Lounge is a great spot for sophisticated Après-Ski in winter and ideal for a drink in a cosy atmosphere in summer. Welcome to a magic place. Between tradition and innovation, the Mirabeau offers comfort and atmosphere at the highest level  only a few minutes walk from the village centre, the train station and the mountain railways. Accommodation  authentic, unconventional and individual: Stylish rooms with simple elegance await you in the main house. In the newly built Alpine Residence, you reside in a refined Alpine atmosphere. This is the perfect place for anyone looking to experience nature and the mountains. Hotel Riffelhaus is an ideal point of departure for long hikes and first climbing experiences. But it is also the perfect place for mountain lovers who have less sporty ambitions. With the reconstruction, the hotel has created one of the most beautiful sun terraces in Zermatt, a spa centre from where there is an unrivalled view of the Matterhorn and newly renovated rooms offering a lot of stylish alpine touches. The Hotel Pollux is a 4-star hotel, situated in the centre of Zermatt, 200 m from the train station. We have two restaurants; in the “Pinte” we serve regional and Swiss specialities like cheese fondue or Raclette, in the “Arvenstube” we serve international and Mediterranean food. Further we have a cosy hotelbar with fireplace, a conference room, a relax area with Finnish sauna, steam bath, Jacuzzi, magic shower and solarium. At the heart of the breathtaking Alpine landscape around the world-famous Matterhorn, our two chalets offer a divine oasis of peace and tranquillity. Enjoy an active or relaxing break in the heartwarming atmosphere of Hotel Matthiol. Welcome! The Hotel Gornergrat is built in traditional local style and is centrally located, just opposite the main train station. To the train to the Gornergrat it is only 20 meters by foot, as well to the ski-bus station. 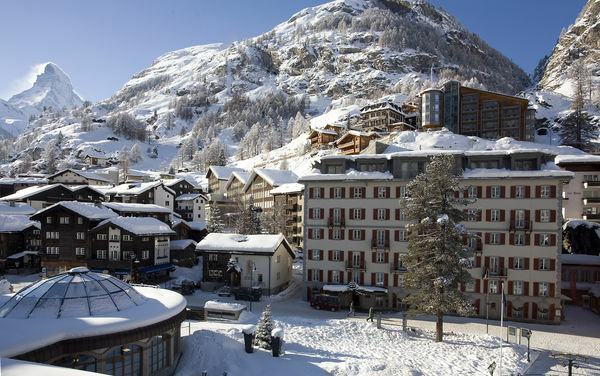 The Unique Hotel Post 4* superior is located in the center of Zermatt. The 29 rooms & suites are rustic but still elegant in a Mountain Lodge style: Contemporary design as a connection of authenticity, individuality, tradition & modernity. 4 restaurants, 5 clubs & bars, 1 hotel with wellness facilities. Everything under 1 roof!